A few months ago, I did a blog post about my son’s archery team. He’s part of a middle-school team that competes at a pretty elite level. His 6th grade team won the Texas state tourney and placed 14th at Nationals. The 7th/8th grade team won Texas and Nationals. This weekend, my family is driving to St. Louis to watch them compete in the World tournament. It’s pretty exciting stuff to see them excel at their sport. Even more so when you come to understand the commitment and discipline it takes to learn how to shoot. Even the smallest thing can throw off your aim. My son told me once, “After I figured out I needed to take in a little breath and hold it before lining up and loosing an arrow, I got better.” Breathing literally could be the difference between a 7 and a 10 for that arrow. Crazy, right? Writing can be like that, too. One of my favorite comments to use when beta reading is “small moves.” What I mean by that is keep the scene focused down on what the character is feeling. Don’t let your character go off on a tangent. Don’t pull away from what is most important right that moment. Keeping more intense scenes under closer focus brings out the intimacy between the reader and the character. Sure, there are scenes that need to be Epic Epicness and that’s perfectly okay, but sometimes even the biggest, most important scenes need some small. For a critical scene in Sidelined — a basketball game — I kept the focus tight on my main character and what she was feeling right that second: the sounds, the tactical, the sensory. By staying more primal and visceral, it felt, at least to me, that I was right there with her, my heart pounding, the screams of the crowd echoing in my ears. One of my favorite books, Daughter of Smoke and Bone, manages to convey that feeling all the way through. The writing is evocative and lush and even though it’s in third person, the reader is deep, deep in the moment with Karou pretty much all the time. I’m sure there are a lot of other examples out there. What’s your favorite? What scene has captured you not because it was big and grand, but because it was small and engrossing? 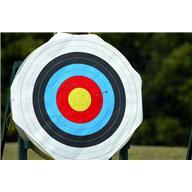 This entry was posted in Blog and tagged archery, St. Louis, Writing on June 28, 2013 by Kendra. Damn–you’ll be in my home town and it has to be in the summer? The humidity has been brutal lately, so make sure that you stay hydrated, you’ll be sweating like crazy. Best of luck!